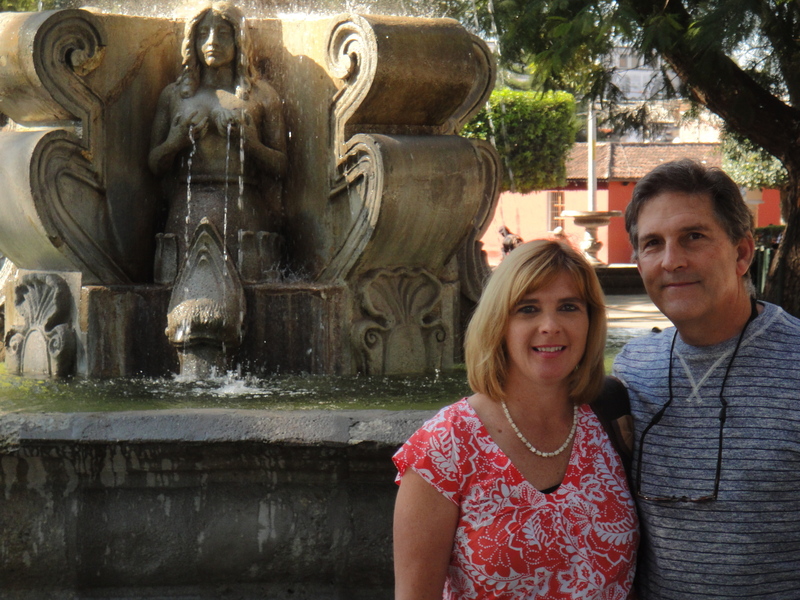 In December of 2014, Steve and I took a trip to Guatemala, in part to visit a coffee farm and get a tour of the production of coffee from seed to brew. The tour was fascinating and we think that the information we will pass on to you our customers, will be equally interesting. The coffee industry in Guatemala used to be much higher than today but currently, 15% of the country’s economy is coffee production. There are 37 volcanoes in Guatemala. We got to see five of them, including one erupting and visible from Antigua. Coffee is grown in the high altitudes of these temperate mountains and grown in the rather acidic soils of these very fertile volcanic mountains. Coffee was introduced to Guatemala in 1775. 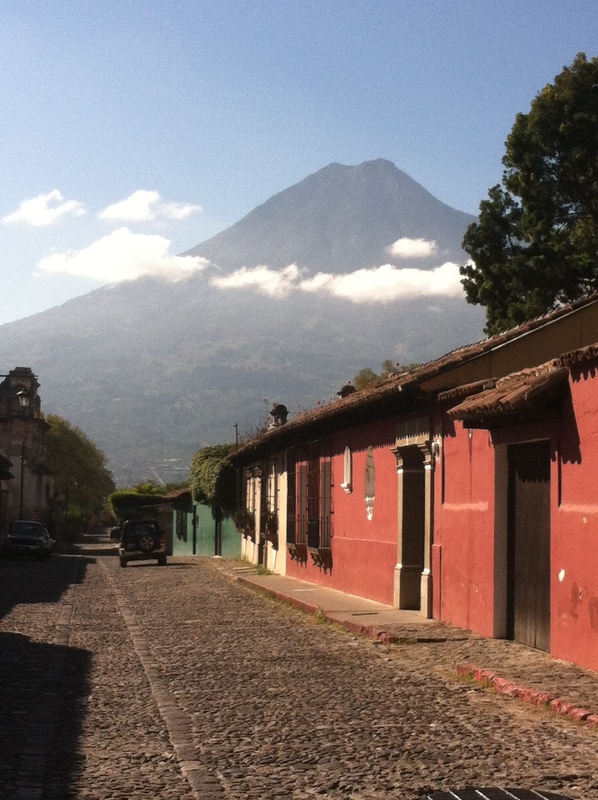 It was only a year later that Guatemala suffered a devastating earthquake, toppling much of the city of Antigua. They have since endured several other severe ones, including the latest in 1976. 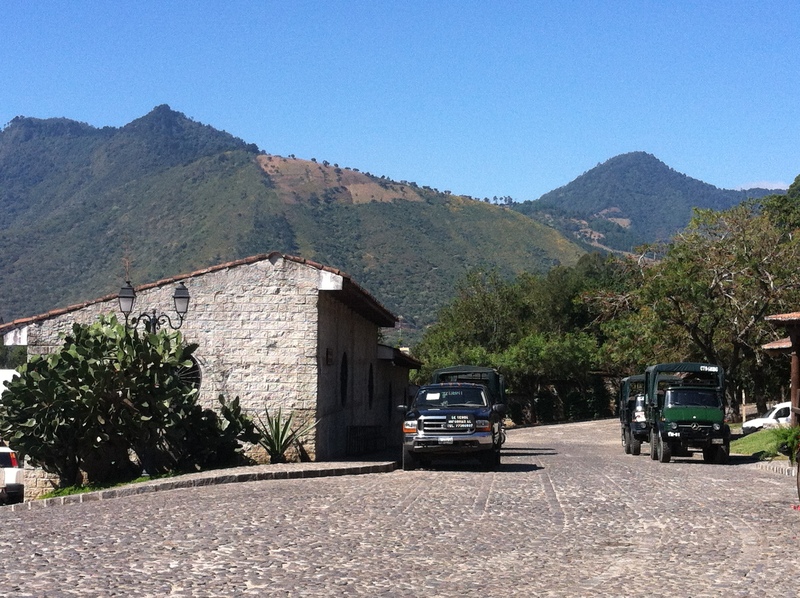 La Finca Filadelfia, a coffee farm just a couple miles outside of Antigua, used to be a cactus farm where cacti were grown for its red fruit to make a valuable red dye. When other countries took over dye production from other sources other than cacti, the farm started growing coffee. This farm has been in the same family since 1864. Prior to 1960, coffee plants were being destroyed by nematodes that burrowed into the roots of the Arabica coffee. It was discovered that nematodes didn’t like robusta coffee roots. So, in 1962, farmers perfected a technique by which they would graft a seedling of an Arabica plant onto the root of a robusta seedling. This does not affect the flavor or quality of the coffee plant since essentially the plant is Arabica, growing on the roots of the robusta. Only women do this particular job at the farm for several reasons. For one, it takes patience and fine motor skill dexterity, and two, a woman’s PH is less acidic than a man’s. About 65% of plant seedlings die if a man attempts to graft the plants, while only 5% of plants die when women do the grafting. A woman can graft 2 seedlings per minute. Once the plants are grafted, they are planted outdoors in special area called the nursery. Here plants grow for 4 years before they are ready to be harvested. 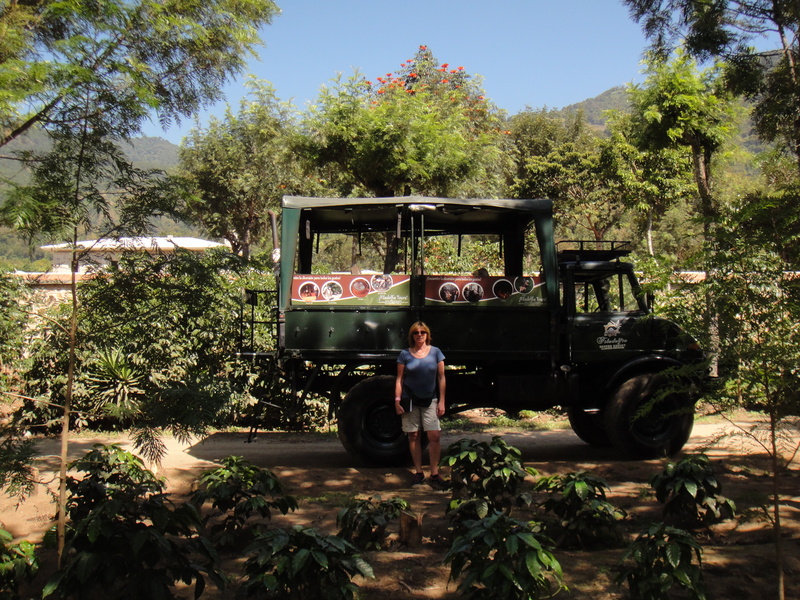 All the coffee grown here by the way is shade grown as are most of the plantations in Guatemala. Not only does it grow better quality coffee, but it is environmentally responsible since the trees grown with the coffee provide essential nutrients, and canopy for birds, insects, and animals for maintaining their precious ecosystem. 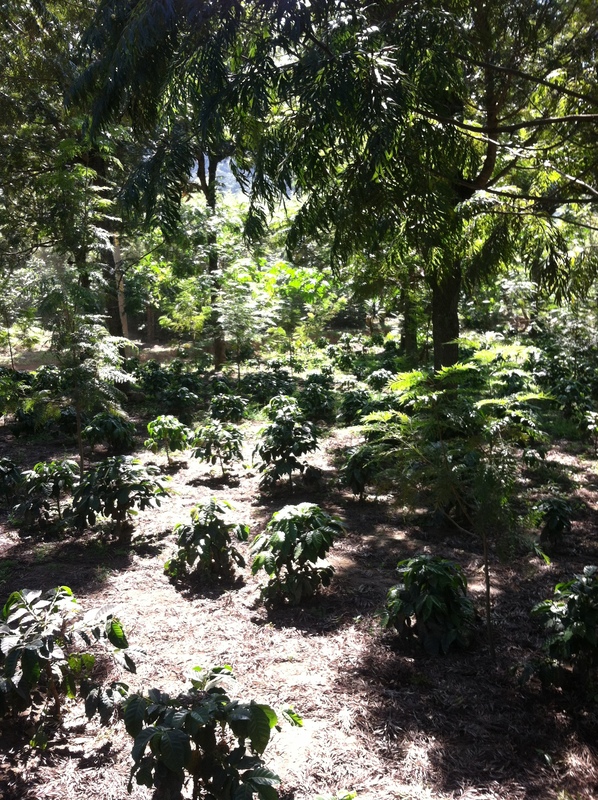 Central America has already lost a great deal of their forests and the recognition of the importance of shade grown coffee has helped maintain the forests. 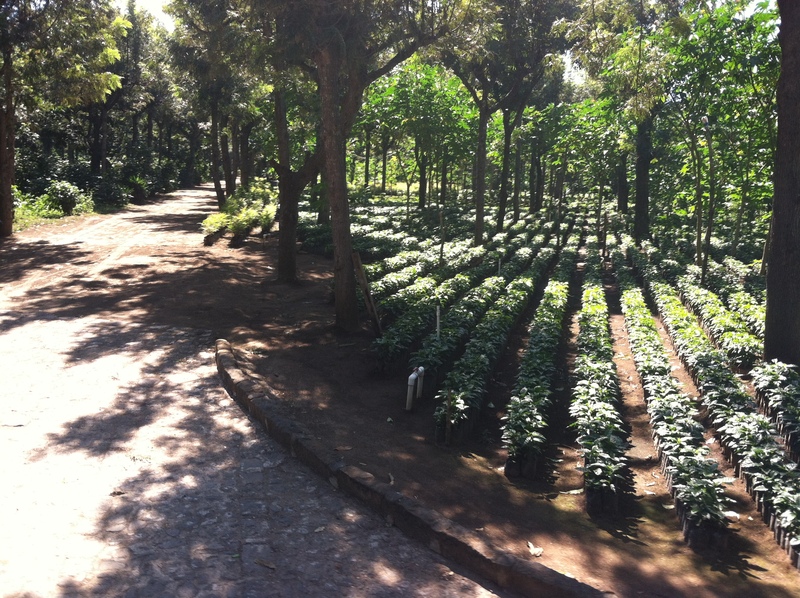 Coffee here is naturally fertilized, meaning that it is wind and water that fertilize these plants. Coffee blooms in May with white flowers that smell like Jasmine. Blossoms live only three days. When the flower drops, it leaves the fruit behind. Inside the fruit are usually two seeds, or beans. The fruit starts off green, then turns yellow, orange and finally red at time of harvest. 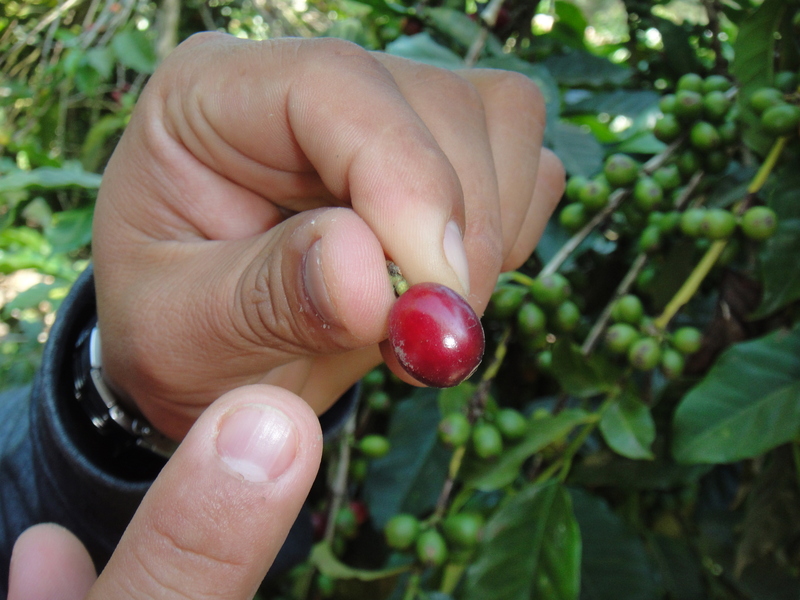 The fruit of the coffee is picked by farm hands, most of whom are migrant workers. It takes six months to harvest coffee (November – May). The other six months are used to maintain the farm. Some farm hands stay on but most move on to harvest another product somewhere else. Migrant workers live for free on the estate for the six months that they harvest coffee. 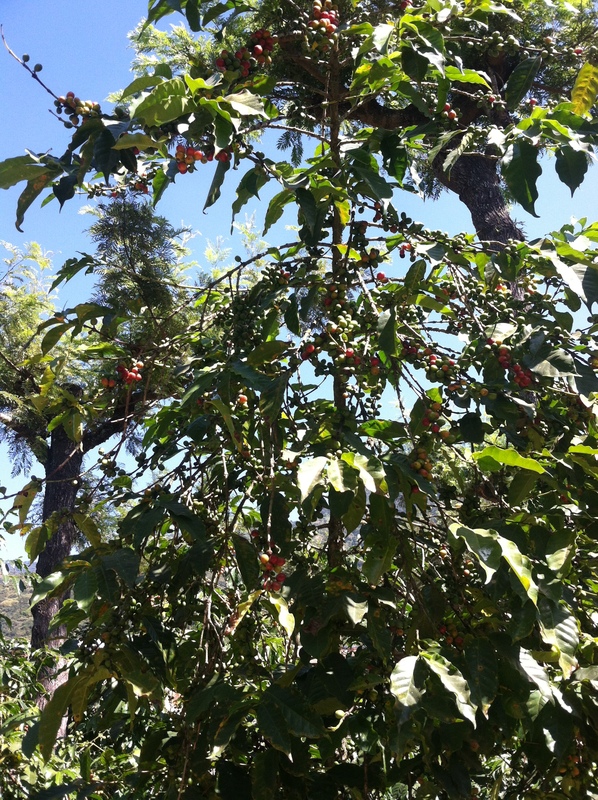 You may be surprised to know that coffee trees are typically only about 6’ tall. Because the branches are very flexible, it is easy to grab a tall branch and bend it down to pick the fruit up top. It is not often that ladders are used. Each berry fruit (looks similar to a cranberry) is picked one at a time by twisting three times and pulling. The fruit is then plopped into a basket carried around the waist or across the back. Because the fruit on the same plant matures at different times throughout the 6 months of harvesting, a picker may end up returning to the same trees 5-6 times. Once the beans are picked, they are brought back to the processing area – a large covered building made of cement walls and floors. Beans are put into a pulper which removes the fruit leaving behind a slimy pair of coffee beans covered in mucilage and silver skin. These pulped beans are then placed into large cement vats to ferment for 20-24 hours on warm days and 30 hrs on cold days. Fermenting reduces acidity and adds aroma and flavor. The fermenting process is a bit tricky as too much fermenting can ruin the quality and flavor of the bean. In the rinsing process, beans are separated according to quality. Lesser ones float and better ones sink. The better beans will take 8 days to dry while lesser ones may take 20 days. 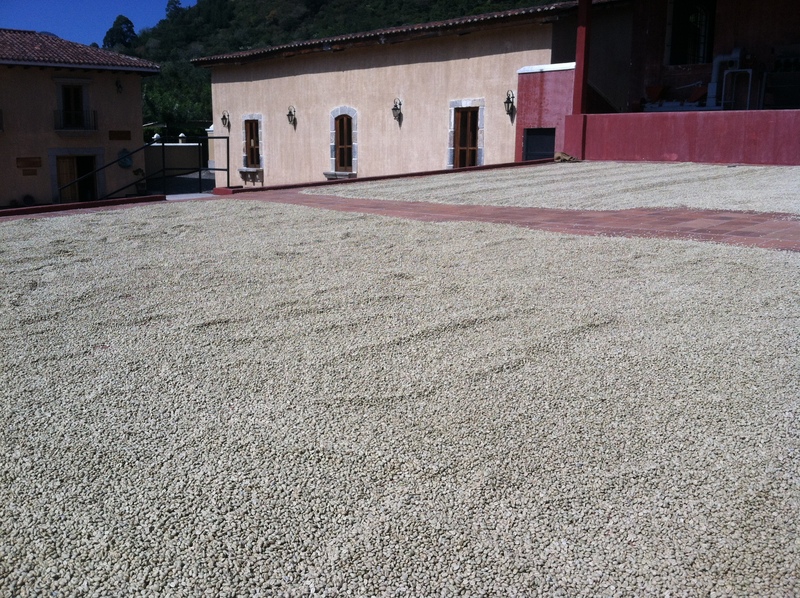 Once the beans have been pulped, they are rinsed and sent to brick patios to dry. About 75% of the pulp is put back into the soil in the form of compost. The other 25% is used to make a coffee marmalade. When beans hit the patios, the parchment and silver skin are still on the bean. Beans are raked in the sun every 45 minutes to ensure thorough drying. The climate here is quite conducive to the drying process since the days are warm and sunny with no humidity, and very little rain. Nights are cool. After the beans are dry, they get raked up and put into a huller machine which uses friction to remove parchment and silver skin from the beans. Green, dry beans are now ready for roasting. 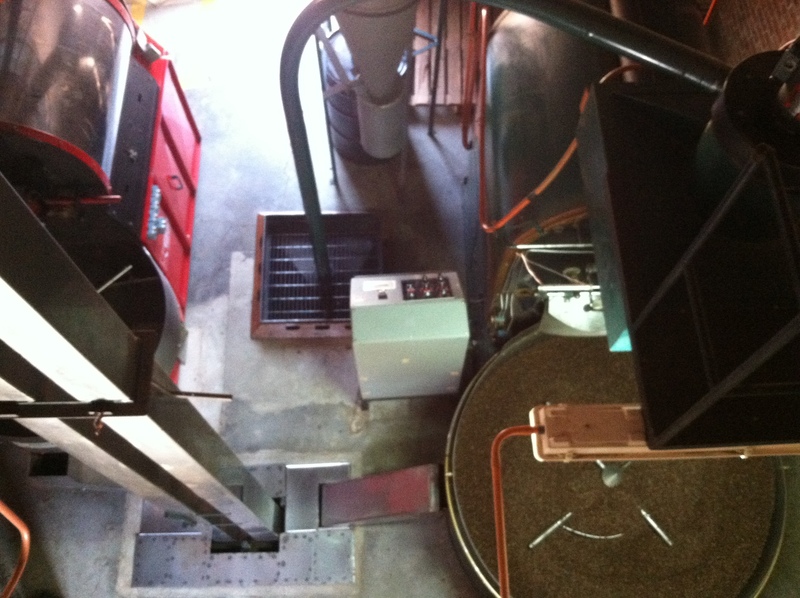 This farm has three different roasting machines of varying sizes and made in different countries. They can roast 25lbs in 15 minutes, and 150lbs batch in 25 minutes. Beans are immediately cooled in broad fat bottom, shallow stainless steel containers with small holes (we have similar containers) where beans are stirred and cooled. 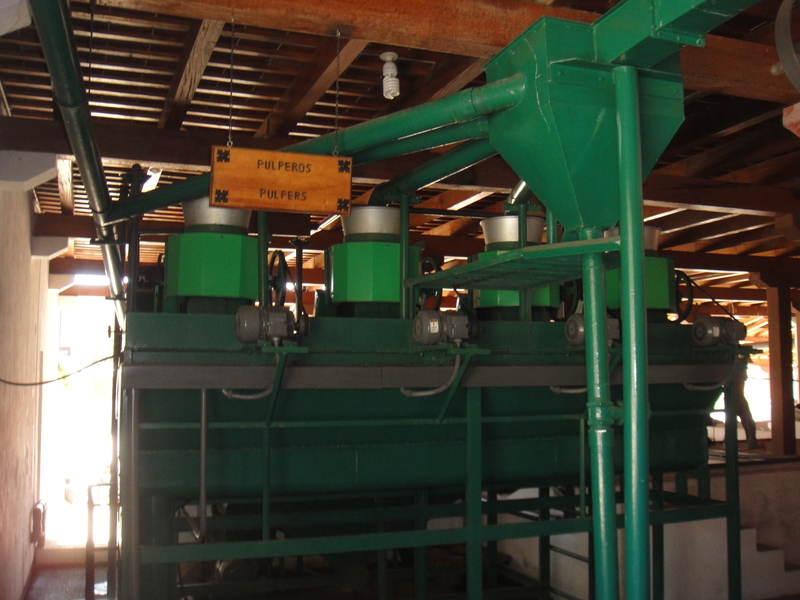 Unlike our production, Filadelfia’s beans are then put into a machine for degassing. We use coffee bags with degassing valves for this purpose so there is no need for this degassing process. (Beans emit CO2 for up to 48 hours after they are roasted. A one way degassing valve allows these gasses to go out but not allow O2 to enter, and thus causing coffee to go stale.) 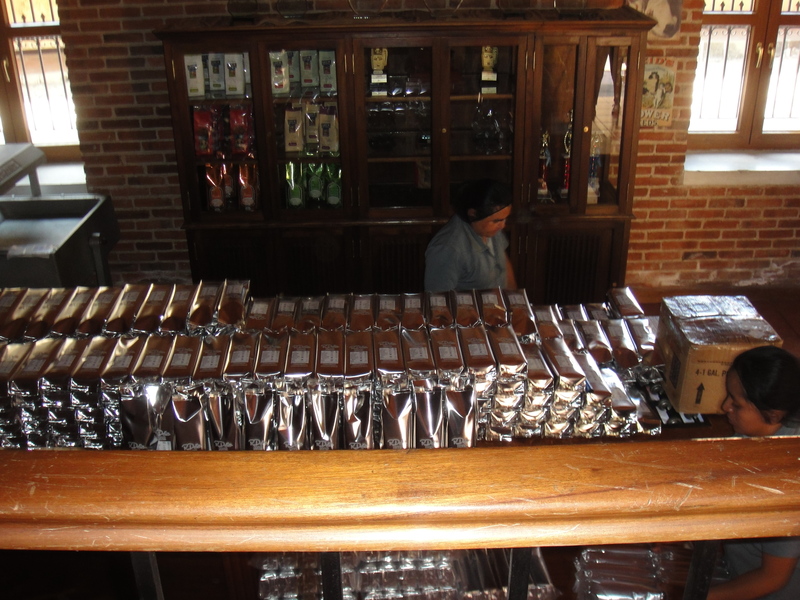 The degassed coffee then goes into coffee bags with labels for selling to customers. As you can see, coffee production involves many people and many steps. By the time you get the coffee you drink, two plants have been grown, then grafted together, the plant has grown at least 4 years and up to 55 yrs., been picked of its berries multiple times in one harvest year and of course by hand one berry at a time, pulped, fermented, dried, roasted, taste-tested, packaged and delivered. When you get the coffee from us, it comes from an exporter of coffee who tastes the harvest and makes “cupping “notes available for buyers to ensure good quality and who also get a cut of the proceeds, then the coffee is bought by us the roaster who roasts, cools, packages, labels, and delivers your coffee for pickup. Seems like a deal at $10-$12/bag now doesn’t it?